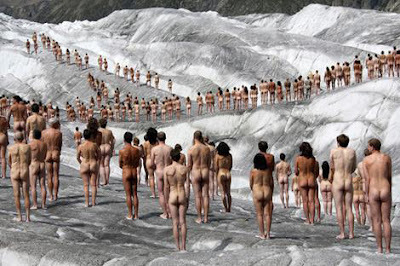 In August 2007 artist Spencer Tunick created an installation with Greenpeace to bring attention to the vanishing Aletsch glaciers in Switzerland. As a fellow artist, I have tremendous respect for the beauty of natural forms, both in nature and the human body. The pairing of both is exquisite in Tunicks work.